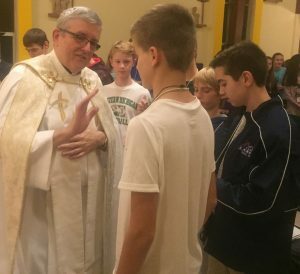 For adults interested in Confirmation, please contact the Adult Faith Formation Office at 734-821-2125 (Marty Lucas at mlucas@stfrancisa2.org). For teens preparing for Confirmation, please contact the Religious Education Office at stfreled@stfrancisa2.org or 734-821-2130 (or Ellen Ward, Director at ward@stfrancisa2.org). The sacrament of Confirmation is received in the 8th grade with preparation beginning in January of the 7th grade. Please be assured that all the following expectations listed below are discussed and spread out over 15 months of preparation. If you have any questions or concerns, please do not hesitate to contact us. We are here to help your child succeed in their Faith! Register for Confirmation using the 2018-19 Confirmation Registration form. Register and attend religious education classes. The registration for 2018-19 classes is found online and by download. (Students enrolled in St. Francis School receive religious education instruction during the school day and do not need to re-register for classes). Commit oneself to consistent personal prayer. Maintain an open and honest relationship with one’s sponsor or mentor. Please indicate your chosen sponsor on the Confirmation Registration Form. Choosing a sponsor? See the information on the role of the sponsor. Attend Mass regularly on Sundays. Attend the Confirmation Presentation Mass for candidates (and sponsors if available). Complete all entries in the sponsor and candidate books. Participate in one of the two scheduled retreats. Choose and sign up for the October or November 2018 retreat here. Willingly engage in 30 hours of community service, filling out and submitting the Service Hour Form. Prepare an oral report about the Saint/holy person chosen for one’s Confirmation and complete the Name Form. See choosing a name or Choosing a Saint for information. The Celebration of Confirmation usually takes place in mid to late Spring. See Ceremony information for information. Meeting Dates and Times. See the 2018-19 calendar. If your child has missed some or all grades, there is a place for your child to begin sacramental preparation. For more information regarding your older child please contact ward@stfrancisa2.org (Ellen Ward) or 734-821-2132.